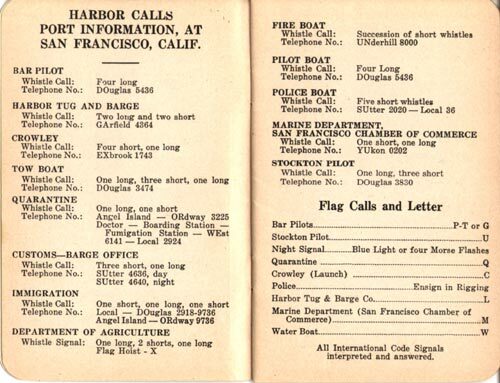 A page from the San Francisco Bar Pilots 1945 Tidebook showing local harbor calls in effect that year. Note the six-digit phone numbers. The information from the 1945 Tide Book is of course completely out-of-date. Please consult the latest editions of the United States Coast Pilot, Volume 7 and the International Code of Signals for the correct present-day signals and contact information.